Schinckel Hayrakes owner, Simon Schinckel, and assistant, Grant Robinson, with the Next F-series trailed finger wheel rake that took out this year’s Henty Machine of the Year award. 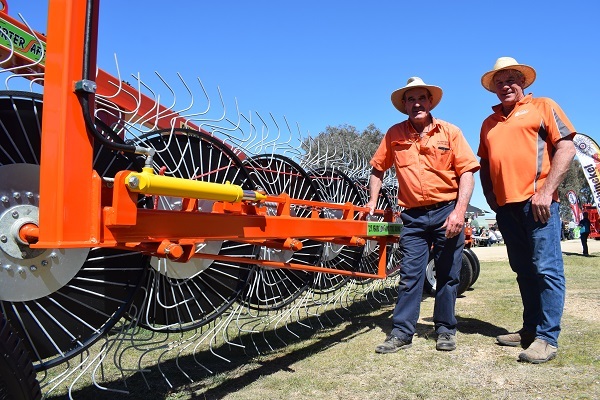 A SIMPLER, safer, ‘sexier’ trailed finger-wheel rake manufactured by South Australian company, Schinckel Hayrakes, Naracoorte, has taken out the Machine of the Year award at this year’s Henty Machinery Field Days in southern New South Wales. Topping a field of 24 entries, the Next F-series V-rake impressed the judges with its simplicity, ease of operation and price competitiveness. Featuring self-opening wings to reduce heavy lifting by the operator, the V-rake has telescopic arms fitted to the raking arms and main beam. Schinckel Hayrakes owner, Simon Schinckel, said it was the second Henty win for the business which took out the award a decade ago with an open and shut rake that “had all the bells and whistles”. “We still make them but they are in the $70,000-$80,000 range. But this new, F-series is so much simpler to handle. There is no lifting to do or pins to take out. It is simpler, smarter and safer,” he said. Mr Schinckel said this year’s prize-winning machine featured a number of new design elements that improved the opening mechanism and allowed the raking width to be pre-set. “There is an easy opener on the front and steering dampeners on the casters. By using the easy opener, you just driver forward and it opens the raking arms out to the required raking width,” he said. “There are holes in the telescopic arm, so you can pre-set it with a pin on a magnet switch that allows you to rake to the width you require. The magnet takes 150 pounds to break the strain so it won’t bounce off in the paddock or on the road. You just leave it set, pull the raking arm out, drop the pin that holds the telescopic arm in position and go raking. The Naracoorte business started out making stock crates, and has been making hay rakes since 1991. It has produced nearly 1400 for the Australian market so far. “We don’t just make rakes for hay work. We make them for raking stubble, raking clover burr,” Mr Schinckel said. The Henty Machinery Field Days began today and will continue tomorrow and Thursday.